Iron Man 3 is a 2013 American superhero film based on the Marvel Comics character Iron Man, produced by Marvel Studios and distributed by Walt Disney Studios Motion Pictures. It is the sequel to 2008’s Iron Man and 2010’s Iron Man 2, and the seventh film in the Marvel Cinematic Universe. Shane Black directed a screenplay he co-wrote with Drew Pearce, which uses concepts from the “Extremis” story arc by Warren Ellis. The film stars Robert Downey Jr., Gwyneth Paltrow, Don Cheadle, Guy Pearce, Rebecca Hall, Stephanie Szostak, James Badge Dale, Jon Favreau, and Ben Kingsley. 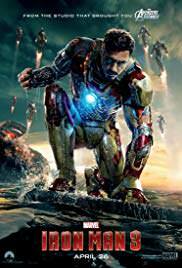 In Iron Man 3, Tony Stark deals with posttraumatic stress disorder caused by the events of The Avengers, while investigating the reemergence of the Ten Rings, led by the mysterious Mandarin and comes into a conflict with old enemy; Aldrich Killian.